Conferences are not only about presentations, but also about getting together, networking and exchanging ideas in less formal settings. This is why the participants of the IAPTI 3rd International Conference can take part in a number of exciting networking and social events. FRIDAY 04/09/2015 from 6.30 to 10.30 p.m.: We’ll be hosting a pre-conference party featuring buffet dinner, drinks, desserts, wine tasting and live music. Venue: Théâtre le Levain (26 rue de la République, 33130 Bègles). MONDAY 07/09/2015 from 9.00 to 11.30 a.m.: Guded tour in Bordeaux, with a professional guide. 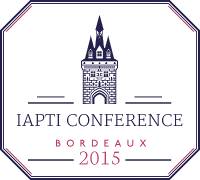 This visit is IAPTI’s courtesy to conference attendees. Meeting in the hotel lobby at 8:55 am. From 1.00 to 7.00 p.m.: Excursion to Saint Emilion with guided visit + wine tasting. Meeting in the hotel lobby at 12:50. If you’d like to take part in any of these exciting events, secure your place now! Click here to see the different menus. Please make your choices for the gala dinner and the Sunday dinner by Tuesday August 25.